It was a pleasant, cool first day of meteorological summer across the valley with highs generally in the upper 70s. It will be a tad warmer on Monday with temperatures pushing 80 degrees. There will likely be a few isolated showers that develop across the the mountains during the afternoon and work east into the area. Most will stay dry, but any storms will be capable of producing some brief heavy rain. Activity will fizzle out once the sun goes down. A better chance for storms will be around during the day on Tuesday out ahead of the trailing front of a low sprinting across the Great Lakes region into Canada. Temperatures will once again make it into the lower 80s. This front will push through and get strung out west to east on Wednesday. This will be the warmest (and likely driest) day of the week with temperatures up into the mid 80s. Just how far north the east-west oriented front sets up will determine our weather for Thursday. 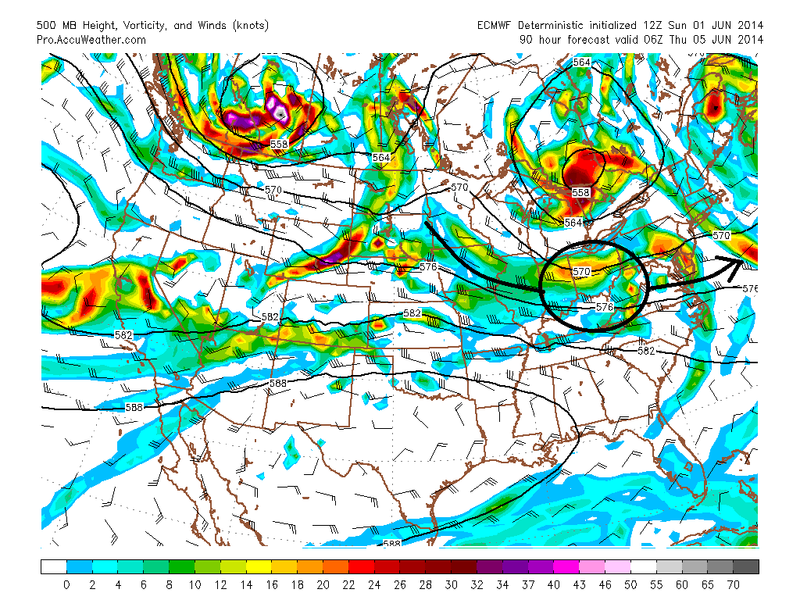 A piece of energy is expected to kick out of the plains and ride east along it. This may produce an MCS (mesoscale convective system). Right now, models aren't in great agreement where this occurs. The NAM tracks it across the Great Lakes into southern New England, while the GFS and EURO are much farther south across the Ohio Valley and into the mid-Atlantic. A MCS always has the potential to produce severe weather so this period will need to be watched. The Storm Prediction Center is already highlighting the potential in their Day 4 Severe Weather Outlook. In other news, today also marks the beginning of hurricane season in the Atlantic. Below are a few predictions from The Weather Channel and Colorado State University. The east coast is surely due.